Intimidation and abuse of MPs and other people in public office has become worse in the current political climate, a former head of MI5 has said. Lord Evans - the chairman of the Committee on Standards in Public Life - told the BBC it was not just a Brexit-related issue, although that had made things "particularly acute". He said some MPs were limiting what they say on public matters. 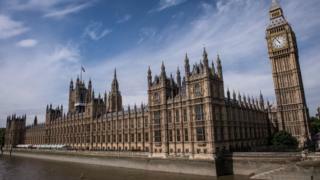 It comes as Met Police figures show a rise in offences against MPs last year. Speaking to Radio 4's World At One programme, Lord Evans said he was "very concerned" about a "problem that isn't going away". Lord Evans, director general of MI5 between 2007 and 2013, said the threat came from across the political spectrum and has deteriorated since his committee published a report on the issue in December 2017. He said: "Although there are strong political feelings... it should not and cannot be allowed to spill over into abuse and intimidation." Lord Evans added: "When you get to the point of death threats, when you get to the point of daubing of properties - that is absolutely clearly beyond any acceptable level in a democracy." He said the problem was connected to the "political conflict that is going on over our future in or out of Europe" although such behaviour was not confined to the UK and was a "sign of our times". Lord Evans suggested the levels of intimidation were having a damaging impact on public debate and represented an attack on parliamentary democracy. He had three conversations with people who have said they are aware of cases where MPs are "so concerned that they are both limiting what they are willing to say on public matters, and there is a risk that they will actually feel that they have to change the way in which they are voting". His comments come a day after anti-Brexit Independent Group MP Anna Soubry said she was unable to go home this weekend to her Broxtowe constituency because she was facing "serious" death threats. Meanwhile, MPs were urged to take taxis home from Parliament and not travel alone in the coming days, over security fears. Deputy Speaker Lindsay Hoyle has written to all MPs ahead of potentially crunch Brexit votes next week, saying police forces have been told to be aware of tensions both at Westminster and locally. Max Hill, the director of public prosecutions, has also written to the Commons human rights committee saying criminal offences against MPs "imperil both the democratic process and public service". A Metropolitan Police team was set up to deal with crimes on the Parliamentary estate and against MPs across the UK after the murder of Labour's Jo Cox in 2016. A Freedom of Information request by the BBC shows that 142 offences were reported to the unit in 2017. These included 90 offences related to malicious communications, such as threats via social media e-mail or telephone, as well as harassment and assault. In 2018 that increased to 270 offences - with the figures showing the number of reports of malicious communications to the police doubled.